In this months column I’d like to focus on a lesser acknowledged reason for why a patient would see a Chiropractor, that is chest pain. Chest pain and epigastric (just below the sternum) pain is a very common symptom that presents to Chiropractic clinics every day. Sometimes it may not be the patient’s main complaint but it may show up as their second or third complaint. Chest pain of non-cardiac origin is commonly a referral from the thoracic spine (the mid back) or can be pain originating from the rib and sternal joints around the breast bone. 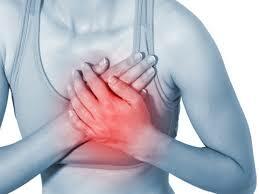 As well as mimicking cardiac pain, this kind of pain can also mimic indigestion and reflux. Chest pain is common in people who spend a lot of time sitting, like office workers and drivers, in this instance chest pain comes on when the thoracic spine stiffens due to inactivity. Once stiff it is very easy to sprain and strain the thoracic spine or chest and from a patient’s history it’s normally reasonably easy to differentiate whether this pain is from a musculoskeletal or organic origin. A recent study in Denmark published in a well know scientific journal compared the treatment of 115 people who presented to Chiropractic clinics and the local hospital emergency department with sudden chest pain1. 1. Chiropractic treatment vs self-management in patients with acute chest pain: a randomized controlled trial of patients without acute coronary syndrome. J Manipulative Physiol Ther. 2012 Jan. 35(1) pgs 7-17. Stochkendahl, M.J. et al.